My immigrant great grandparents ran a small grocery on the Lower East Side. It was essential that my Grandma Mary drop out of school at age sixteen to help in the store so the family could save money on staff. Her educational sacrifice paid off in helping “the boys,” her brothers, go on to college. Since then, all of the siblings’ future generations, male and female, have graduated from fine colleges and universities. And the Lower East Side has morphed into a chic destination that contains expensive condos, craft cocktail bars and artisanal ice cream shops. The pushcart past has pretty much disappeared but can be glimpsed in a visit to The Tenement Museum on Orchard Street or during a historic walking tour of the old neighborhood. My brilliant grandmother went on to educate herself through wide reading and concert-going. She was highly self-disciplined and aspirational and always rued her lack of higher education. One of the many things she did out of pride was train herself to pronounce “th” and “r” properly. Others might say “toity-toid” (Thirty-third) Street, but not her. I can only imagine how she might have loved this trendy CornerGrocers at Delancey and Rivington that looks like a home refrigerator on the lam. Whoever stocks it has a keen eye for display—it’s organic street art. And best of all, perhaps the convenience of the self-service aspect (though you have to pay inside), has allowed future Marys to stay in school. I love using Google to cook, particularly in summer. Not just because you can search the recipe for Alache Soup (above) but also because you can buy whatever looks freshest without fear of failure. 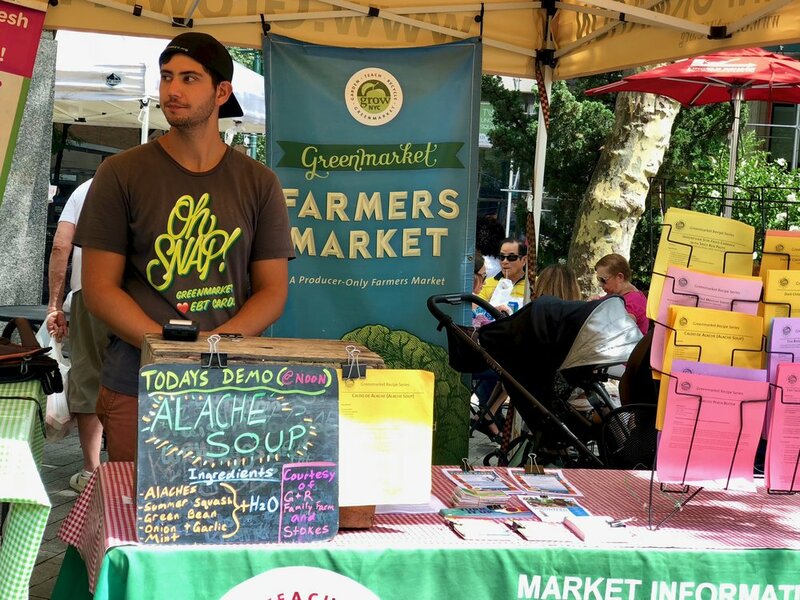 After I greedily shop one of New York City's many Green Market farmer's markets, I google my bounty online with the word "recipe" added. It's a little like playing a menu slot machine. You pull the virtual lever and see if you get a winner. This is what I call cooking "forwards." Forwards cooking is ingredient focused. But Google hasn't killed off cookbooks for me. I'm not the only one. The destination cookbook store, Kitchen Arts & Letters on Lexington Avenue, continues to thrive after 35 years in business (read a recent New York Times' profile here.) With books you cook "backwards." You pick your menu first, shop second and cook third. Every summer I pull out favorite cookbooks like Nigella Lawson's Forever Summer (Hyperion, 2003), and Ina Garten's Barefoot Contessa Parties! (Clarkson Potter, 2001). Cooking step-by-step with these old friends puts me in a more meditative frame of mind. Juicy, ripe dishes like Ina's oven-roasted fruit or Nigella's watermelon, feta and black olive salad bring back pungent memories of summers past. Despite a thriving website, Garten has a new book out this fall: Cook Like a Pro: Recipes and Tips for Home Cooks (Clarkson Potter, October 23, 2018). No doubt I'll splurge. Her ethos of the very relaxed hostess keeps performance anxiety in check. Cooking forwards requires creativity, backwards requires intention, but cooking "sideways" (again, my term) is the ultimate in relaxation. All you need is a grill, olive oil, a spatula and a flip arm. Sideways cooking is pretty foolproof. And definitely the summeriest of all. Construction workers spend their day in al fresco cubicles. It's the ultimate transparency. They text, drink coffee, snack and have lunch just like the rest of us, but somehow these mundane tasks seem amplified outdoors. The snoopy public (me, for example), feels like an audience at the theater or an anthropologist in the urban jungle. I pity the guys eating out of lunch pails on a cement sidewalk, and I want to shout at the rooftop texters, "Don't back up!" I personally will jump through any hoop to get my morning coffee, so I watched with empathy as this nimble worker scaled a long ladder on a sticky summer day holding two large iced coffees and a bulky snack bag. When he reached the top he landed the cups, hoisted himself up and over, and prepared to climb higher to his waiting co-worker. I was so thirsty by the time he was done, I had to go get some myself. In his honor, I drank it outdoors. After my local supermarket closed due to rising rent, I began ordering fruit, vegetables, meat and fish from New York area online grocer FreshDirect. Now and then I get a hilarious surprise. Like this gnarled and tuberous Medusa head. When it was unpacked, it turned out to be the size of a brain and the weight of a puppy. Without a penny in the photograph, you'll have to take my word for it. How else would you know? You're in my exact same situation, stuck between a photograph and a thought. A glance at the receipt showed it weighed out at $10.49. Would I have bought it in a store? Never. Still, less of a good story than the time my husband's aunt ordered a catalog sweater for her husband and received a mobile home instead. Or when my father mistyped and bought 1,000 shares online instead of the intended 100 (happily for him, the stock went up). The Internet genies can be capricious. Press the magic button and you never know what might arrive next. Too bad for you, you often keep it. That 70-pound beige wool rug I expected to be ivory? Unrolled, it was too heavy to return. The fluffy featherbed that rose like helium to the heavens? Impossible to stuff back into its original plastic package. And so it goes. Not everything that comes was meant to be. Just last month, gremlins at Bloomingdale's tossed a free $448 silk color-block dress by Tory Burch into my box of promised bed linens. I'd won a lottery I hadn't even entered. It took maximum effort and ethics to return it. I was so flattered by the size 4. One thing I know for sure. Magnificent root vegetables should not be eaten quickly. Repurposed as art, my celeriac was quite the steal. I put it on a marble pedestal and for a few days had an organic Giuseppe Arcimboldo (Italian Renaissance painter of vegetable-headed dignitaries), or bust by Philip Haas (contemporary American sculptural interpreter of Arcimboldo). My kitchen glimmered with the transformation. And then I chopped it into soup. Urban Irony #353: you can shop for growing things while underground yourself. With the onset of Memorial Day weekend, my spring flower craving deepens. 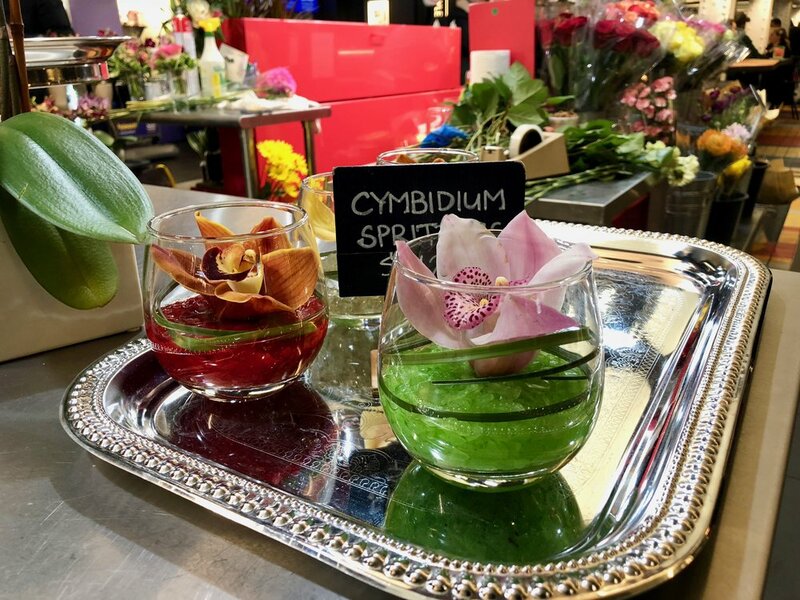 The subway florist Botany Bar, buried down in the Turnstyle Underground Market at Columbus Circle, serves up singular orchid "spritzers" on a silver platter. The whimsical shop also concocts air plant "shots," succulent "flights," and a "six-pack" sampler "for your next BYOP event." I don't just like to BYOP, I also love to seasonally BYOB. Since I can't plant violets on Memorial Day (I've got a park, but no backyard), I drink them. A fragrant bottle of Creme de Violette inspires botanical violet gimlets and brings flower power to my apartment while green thumbs are out in their backyard tilling soil. I may not have a bed of dirt to run my fingers through, but I can work with metaphors. Here's another: You don't have to have a backyard patio to make your life a garden party. American seasonal flavors and scents are threatening to turn pumpkin season into one giant corporate cliché. You know autumn is here when pumpkin donuts, bagels and cream cheese come rolling out of Dunkin' Donuts. Ditto Starbucks' pumpkin-flavored lattés, Frappuccinos® and scones. Even Oreos, M&M's, deodorant, and, hilariously, pet shampoo are getting pumpkinized, reports Fortune. Personally, I like my gourds in shards. 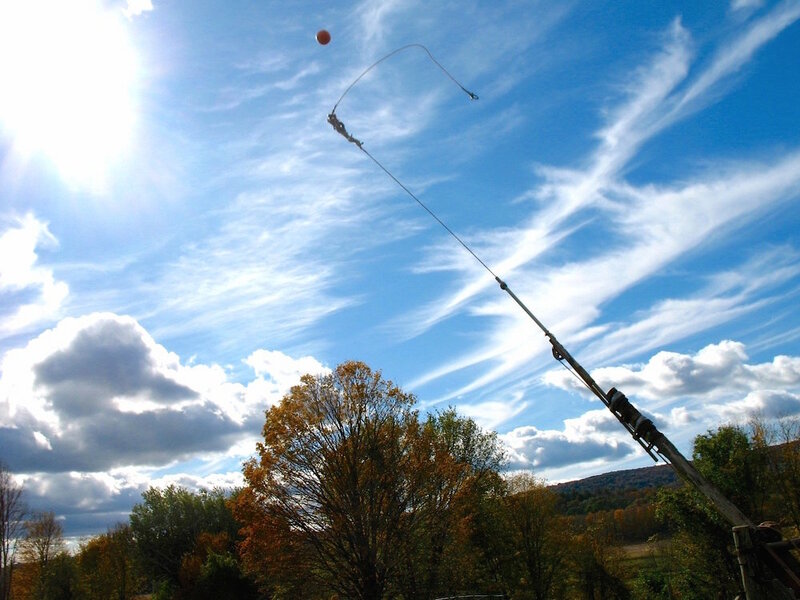 For years, I've applauded the changing of the leaves by watching farmers at Daisi Hill Farm in Millerton, New York, load pumpkins large as cannon balls onto a handmade medieval-style catapult. There's more deep-bodied joy in watching them fly through sky to explode in a distant field than all the pumpkin-spiced goods in the world will ever deliver. Unless, of course, you're the pumpkin. I'm always looking for ideas to change up my life in little ways. You never know when that one small change will have a domino effect that leads to the big Eureka! This clear globe of colorful mixed salad totally amused me. It was served at breakfast in our small Italian hotel. It reminded me of the little forest terrariums I used to create as a kid and also of those enticing gum ball-style machines with plastic balls containing surprise toys. Imagine if a ball with fresh greens had rolled out of the metal chute! This ingenious presentation made me stop, look and admire. Suddenly, breakfast salad seemed like a perfectly compelling idea. And it has ever since.